I am all about Holiday and Celebration Desserts. 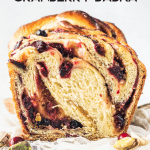 Which explains today’s post, my wonderful Pistachio Cranberry Babka. This post contains an ad. I’ve recently had the opportunity to try Libbey’s bakeware set. Here I express my very honest opinions about the product. Please enjoy the post, the pictures, and thank you for stopping by! 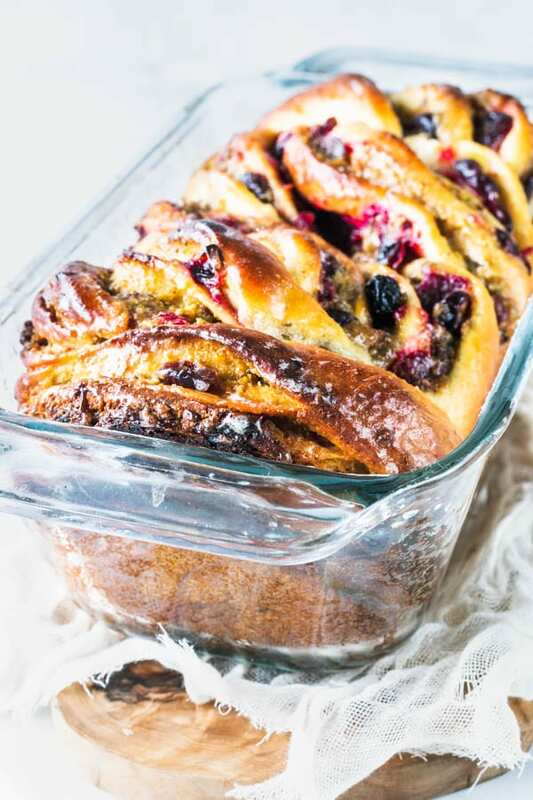 This Pistachio Cranberry Babka was indeed like a celebration in my mouth! One of the best babkas to ever come out of my kitchen. I make babkas quite often, you can see one variation here, my Cashew Caramel Babka. It’s not that I don’t love the traditional chocolate Babka, but let’s face it, you know how much I love reinventing recipes, and how I always say that you most likely won’t ever see me posting a recipe such as Chocolate Chip Cookies or something, because it simply doesn’t interest me to publish a recipe that has probably over hundreds of thousand others out there. I like to keep it fresh. 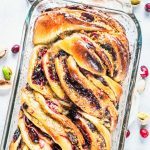 This Pistachio Cranberry babka would be perfect to bring to a Thanksgiving Celebration. 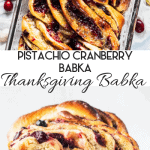 You know what, we should call it Thanksgiving Babka! Let’s do it. 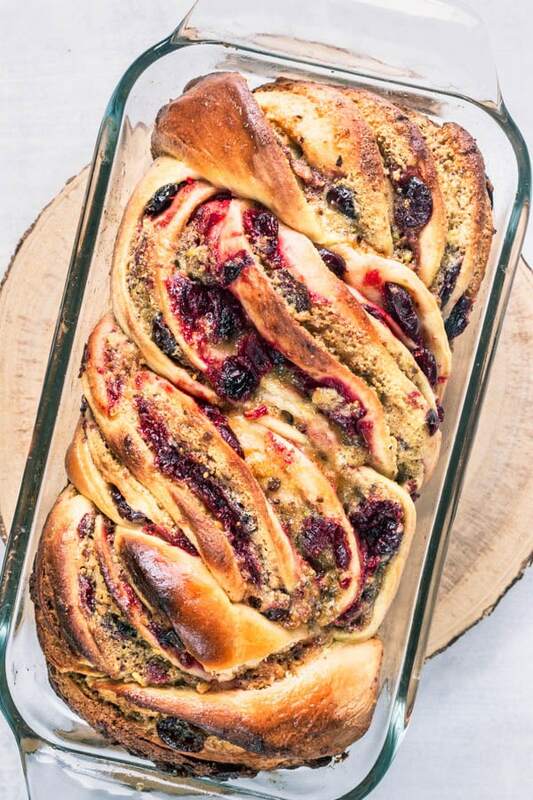 It could be a Christmas Babka too, it’s just as festive. I want to tell you one of the reasons why this was one of the best babkas I’ve ever made. Besides the delicious flavor, I just got this beautiful Bakeware set by Libbey. 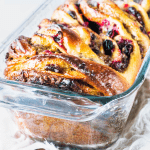 And this 9×5 loaf dish makes the most beautiful and tall Babka bread in the world! The old loaf dish I used before is great and all, but not as tall as this one. My old loaf dish was about 2.5″ tall. Libbey’s loaf dish is an inch taller! It makes a huge difference. Check how tall this babka stands. 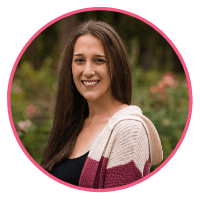 First, you’re going to roll out your dough into a 11×18″ rectangle. Brush the pistachio filling all over the dough, leaving a 1″ edge along one of the narrowest ends. Spread the cranberry mixture over the pistachio. 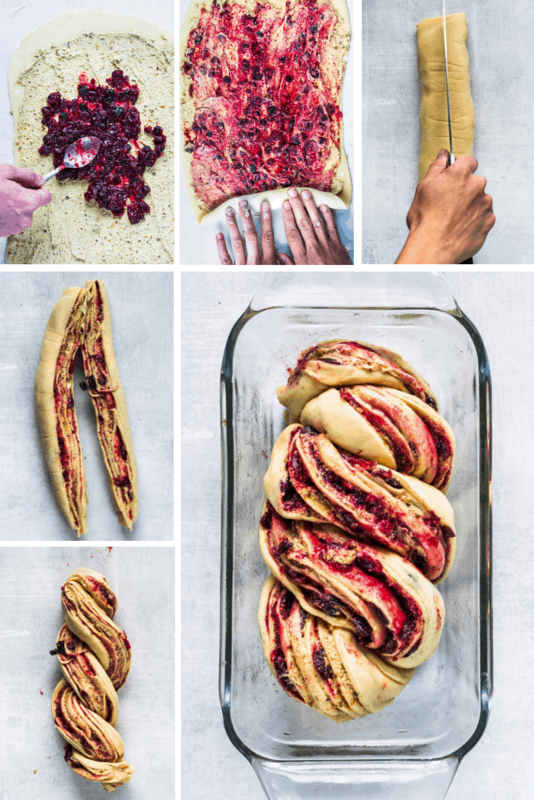 From the dry edge, start to roll up your babka into a log. At this point I stick the logs in the fridge for about 15 minutes so the filling can firm up and make it easier and less messy to braid the babka. Remove from the fridge and use a knife to slice the log into two pieces. Place pieces next to each other, with the open side facing up. Braid both strands by going over and under. 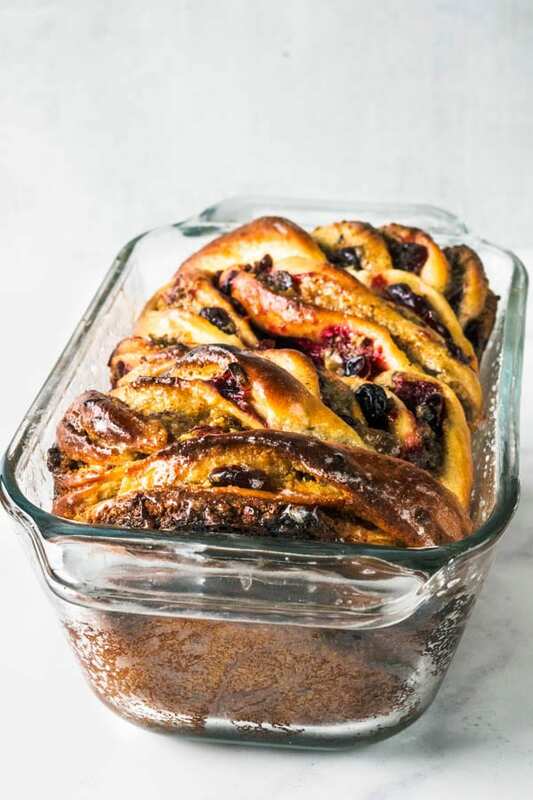 Tuck ends in and place babka in a loaf pan. Check out the recipe bellow for more details. Also, don’t forget to check out my Cashew Caramel Babka, which remains one of my favorites in the world. 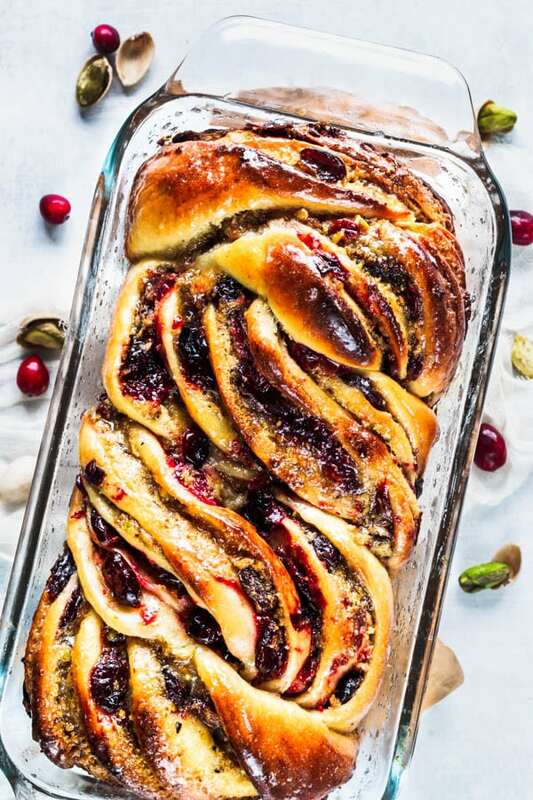 And I could just keep going, so please, would you just make this Pistachio Cranberry Babka, and you’ll see for yourself!! Other celebration desserts you might want to try: Pistachio and Fig Vegan Cheesecake (which you seriously don’t even have to be vegan to make it), Flan Cake, Pecan Fig Cake. 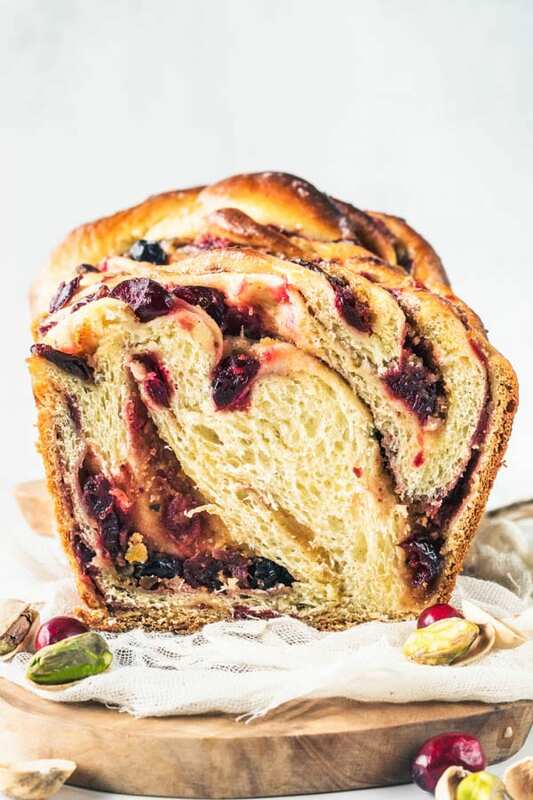 This Babka features a pistachio and cranberry filling, and is a perfect bread for any celebration! Start by making the Babka dough the night before you are going to bake your bread. In the bowl of a stand mixer, add the milk, sugar, yeast, flour, cardamom, eggs, salt, and vanilla. Mix with a spoon or with the paddle attachment until incorporated. Knead dough for about 30 seconds on medium speed. Start adding butter, one tablespoon at a time with the mixer running. It is going to look very messy, but don’t fret! Just keep kneading on medium speed for about 10 minutes. You may add one or two tablespoons of flour if dough seems extremely wet. Move dough to a bowl coated lightly with neutral oil. Place dough in the fridge overnight. Mix all ingredients in a saucepan, bring it to a boil over medium heat, stirring occasionally. Reduce heat and let mixture simmer for about 15 minutes. Keep stirring every so often. Cranberries will start to pop and mixture will become thicker. Remove from the heat, transfer to a heat-proof bowl and let it cool. Place it in the fridge, covered and let Cranberry Jam chill. If you want to make your own pistachio paste, simply place about 1 cup of shelled pistachios in the bowl of a food processor. Process nuts until very finely ground. Start adding water by the teaspoons, to help mixture become like a paste. If you are using store-bought pistachio paste, check if it already has sugar in it, if so, you might want to reduce the amount of brown sugar in the recipe by 1/4 cup or so. Taste the filling and if it needs more sugar, just add as necessary. To make the filling, simply mix all ingredients together until incorporated. You can use an electric mixer to make it easier to incorporate butter, pistachio paste, pistachio nuts, and sugar. Spray your loaf pans with neutral oil, or line them with parchment paper. Roll each piece out into a 18x11” rectangle. Divide pistachio filling between the two rectangles. Use a spatula to spread filling evenly on the surface of each rectangle, leaving a 1" edge along one of the shortest sides. Spread half of the cranberry jam over each rectangle. Use a spoon to slightly smooth it out. Roll each rectangle into a log, rolling from the shorter side with the 1" edge. At this point, I put my logs in the fridge because I wanted the filling to solidify a little bit to make it less messy to braid the babka. Split each log in half lengthwise. Refer to pictures above in the post for reference. Each strand of dough should have the open side facing up. Also be careful not to let the filling spill out. Braid both strands together, by going over and under. Pinch ends together, and tuck them under. Place loaves in prepared loaf pans. Let dough rise for 1-2 hours. Depending on how hot your kitchen is, it might rise faster. The babkas will be ready to be baked when they have almost doubled in size, and when you touch the surface of the dough with your finger, the dimple springs right back up. Before baking I like to brush my loaves with a very light egg wash. I mix 1 yolk with one teaspoon of water and gently brush over my babkas. I don’t like a very thick egg wash for this kind of bread, but a little bit will make it golden and pretty. Bake babkas for about 30 minutes. Start checking at 15 minute mark, cover loaves if they are browning too fast on top. To check, insert a toothpick and it should come out clean. While babkas bake, make the syrup. Bring water and sugar to a boil. Set aside. 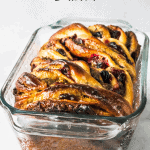 Take babkas out of the oven. Immediately brush with the syrup, dividing it evenly between the two loaves. Let loaves cool down before cutting. Though I love them when they are still a bit warm and all. Irresistible! The babkas will be the most delicious the fresher they are, which means the first day, and a few hours after baking specifically. However, they will keep well for a few days. I would put them in the fridge, in a sealed zip loc bag after the first day. Just take them out of the fridge a little bit before consuming so they can soften up and come to room temperature. Já imagino fazer um desses pro natal!!!! Maravilhoso!!!! Hi Camilla! 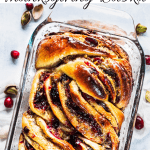 I just pinned your Pistachio Cranberry Babka recipe to my Christmas/Holiday Recipes board! It looks SO good!! I love your photography style!! Awesome work! Thank you Alia, I appreciate it! !